Today on the Doc On The Run Podcast were talking about all the special considerations for runners when they seek treatment for a plantar plate sprain. Sharp or aching pain in the ball of the foot can be distracting when you run. Although there are many conditions that can cause pain in the ball of the foot, there are only a few that are common among runners. Stress fractures are frequent, and may be worrisome, but differ from some other conditions. Unlike stress fractures that often seem to be related to more diffuse pain, several other conditions can be pinned down and you may notice the pain is really in a certain spot at the ball of the foot. If you are a runner and you have pain in the ball of the foot there are really only a few conditions that could be causing the trouble. This episode will be the second of a three part series that explains all of the things you need to think about if you’re a runner seeking treatment for any of these problems. Last week talked about neuroma treatment in runners. Today I’m going to explain a little bit about another condition which is in almost the exact same location as a neuroma. The plantar plate is a small ligament on the bottom of the joints located in the ball of the foot. It is really just a thickening of the joint capsules. Because the plantar plate is located between the heads of the metatarsal bones and the ground, you’re basically standing on the plantar plate whenever you walk or run. If the ligament comes sprained it can be very painful. Often times, runners and even some doctors confuse a plantar plate sprain with a Morton’s neuroma. If you think you have a neuroma but you actually have a plantar plate sprain you’re not likely to get better because the treatment for a neuroma will not heal the plantar plate. The treatments are different. So as we often talk about one of the most important things to do is make sure that you have the right diagnosis as soon as you start to have pain. The stakes are higher for runners. The longer it takes to heal your injury, the more fitness you lose, the weaker you get, the stiffer you get and the longer you stop running, the more risk you become of suffering chronic recurring injuries once you start running again. Now, as we already talked about, a neuroma is a nerve issue. A plantar plate sprain is a ligament issue. The bones in the toes (phalanges) connect to the bones in the foot (metatarsals) at joints appropriately called the metatarsophalangeal joints. The bones are held together and also allowed to move by a number of soft tissues attachments including the joint capsule (which holds the fluid in the joint to provide lubrication) and ligaments (that keep the joint stable). The toes mostly move up and don’t usually move very far down. As a result, the structures on the bottom of the metatarsophalangeal joints are more prone to stress, strain, and injury. The most significant structure on the bottom these joints, is a thick reinforcing area called the plantar plate. Whenever you move or force the toes upward (such as when you stand up on your toes) the plantar plate resists this movement. Stress fractures result from increasing the duration of impact faster than the bones can develop the strength to withstand the impact. In a similar way, the soft tissues that support the bones can also become injured. For example, if a runner is concerned about the impact of running and starts cross training excessively, injury can result. Elliptical trainers are a common culprits. The best feature of an elliptical trainer is that it is very low impact. The worst part is that with every swing of the trainer, the athlete’s foot is dealt an unnatural position that puts a great deal of pressure on the ball of the foot as the foot swings backward. With all of the repeated forcing of the foot up on the toes, the plantar plate on the bottom of the foot can become stressed to the point it develops very small tears. If not rested and allowed to heal these can get worse. When most runners come to see me with this problem, they will describe pain in the ball of the foot that is significantly worse when on an elliptical trainer or walking barefoot of hard surfaces such as tile. It may ache after a run but usually does not hurt much during a run on flat ground. They will also usually describe a “fullness” in the ball of the foot, which they may or may not recognize as swelling. There is almost never any particular recall of how the problem began. Sometimes, if the condition has been getting worse for a while, it appears that the second toe is sitting just a bit higher than the third toe. This indicates a weakness in the plantar plate and joint supporting structures on the bottom of the foot. If the inflammation is allowed to continue, these structures will become weaker. With the continued application of force (repeatedly forcing the toes up through the backswing of the elliptical trainer) the plantar plate may tear completely. Then, the toe dislocates. Fortunately, I have only seen this one time. The patient came in with his second toe pointing at the ceiling and sitting on top of the metatarsal. He was in excruciating pain and required immediate surgery to reposition the toe and repair the torn structures. All of this is, of course, preventable. Just remember that cross training is good, but it is possible to overdo it. Elliptical trainers are great and highly recommended, but resist the temptation to set it at a steep angle. Although setting the machine on a steep angle can make the workout tougher, and hence shorter, it places enormous stress on the plantar plate. Do the same with your treadmill…keep it relatively flat to decrease strain on the ball of the foot. If you do start to notice a sharp or aching pain in the ball of the foot, get it checked out ASAP. If you seek treatment early you may still be able to train and participate in your goal race. You may read about plantar plate injuries and get confused simply because it is described by several differ names. To help you understand the terminology a little better, we will briefly outline the anatomy in the ball of the foot in a little more detail. The little toe joints are each comprised a metatarsal bone and proximal phalanx. The proximal phalanx bone is the first of three bones in each toe. 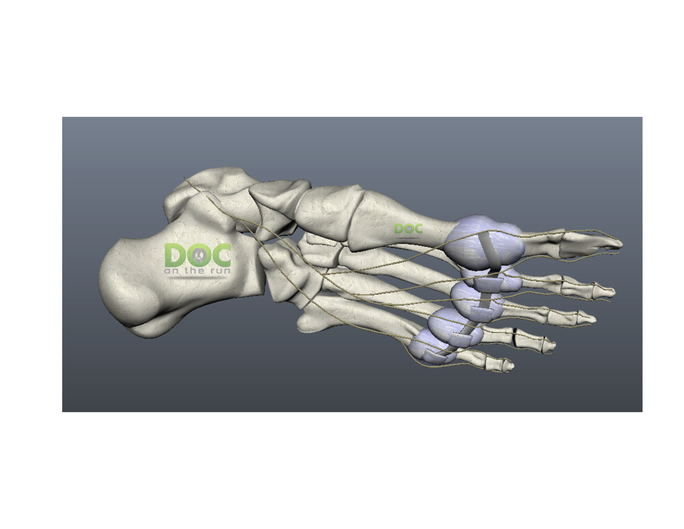 The 5 metatarsal bones are the long bones in the foot. It is actually the head of the metatarsal that takes all of the pressure when you stand, walk or run. If we start at the ground and work our way up, we see that the skin is covering a thick protective fat pad. The fat pad is the natural cushioning material for the ball of the foot. Continuing upward, toward the toe joint we find the plantar plate and intermetatarsal ligament. The inter-metatarsal ligament connects and stabilized the foot by binding the metatarsals together. The inter-metatarsal ligament prevents your foot from splaying out like a duck when you stand and put pressure on the foot. A tough fibrous joint capsule attaches the metatarsal and proximal phalanx. The joint capsule is lined with synovial tissue that actually makes the synovial fluid that lubricates the joint and supplies nutrients to the cartilage inside the toe joint. The toe joint capsule is reinforced with a thick ligament called the plantar plate. The plantar plate stabilizes the joint and prevents helps hold the toe down against the ground when you run up a steep slope or push off with the ball of the foot. A sprain is where there are tiny little tears involving some of the collagen fibers or bundles of collagen within a tendon or ligament. A grade 1 sprain is where there are little bitty tears but that ligament is still basically intact. This is the equivalent to an overstretched rubber band. If you stretch a rubber band and then hold it up the light you can see little areas where there is a tear within the inside of the rubber band. This is analogous to most plantar plate sprains. If you imagine cutting the edge of the rubber band and then you stretched it out and looked at it you would see a cut or rip in the edge of the rubber band. A torn plantar plate is basically a partially torn ligament. In some cases the doctor may tell you that you have a completely ruptured plantar plate. In this case it implies that it is a full thickness tear extending all the way through the ligament and the underlying joint capsule. Typically these have lots of swelling because it’s a significant injury in the fluid inside the joint is leaking out into the bottom of the foot. The plantar plate, as we described is really just a thickening of the joint capsule. So if you stretch the plantar plate enough to partially tear, it’s easy to understand you probably will have irritated and stretched the underlying joint capsule. When the joint capsule get stretched and irritated and inflamed it’s referred to as capsulitis. Basically capsulitis is just one of the minor forms of a plantar plate injury. The inside of the joint capsule is lined with synovial tissue that makes the synovial fluid that lubricates the joint and nourishes the cartilage. Anytime you have capsulitis you’ll also likely have associated synovitis, also they are basically the same. Pre-dislocation syndrome is the term coined by famous podiatrist Dr. Gerard Yu. And one of the papers that is required reading for foot and ankle surgery residents in this country, Dr. Yu explained that in order for a toe to become a dislocated hammertoe, the plantar plate has to become stretched out, weaker and even ruptured before the toe can dislocate. For that reason, he explained that any injury to the plantar plate can be considered pre-dislocation syndrome because if left untreated, the condition can continue to progress and result in a worsening injury with complete rupture of the ligament and dislocation of the toe that requires surgery for repair. One of the most important points of this entire discussion is that if a plantar plates sprained is left untreated it will cause chronic inflammation in the joint which will lead to damage and weakening of the collagen in the plantar plate. So if not controlled and appropriately treated, this condition will almost certainly get worse over time. Many times patients will call me and say that they were diagnosed with metatarsalgia. But don’t be fooled. Metatarsalgia is a symptom not a diagnosis. If you have been told that you have metatarsalgia by a foot surgeon, to me that’s the equivalent of a neurologist telling you how you been diagnosed with a headache. There’s a big difference between a headache caused by a migraine, versus a brain tumor versus a concussion versus a tension headache. If you don’t have the true diagnosis it’s very difficult to believe you’re going to get the correct treatment. As we talked about when we described all of the different names for a plantar plate sprain, there are two basic problems. One is injury to the collagen in a ligament. The second problem is inflammation. If you want to heal as quickly as possible you need to do something to shut off the inflammation and then stabilize and protect the toe enough that the collagen can start to repair any damage and heal the injured ligament. Applying ice is one of the oldest treatments of musculoskeletal injuries. Ice can certainly reduce inflammation, reduce swelling and decreased pain. The only problem with applying an ice pack to the ball of the foot is that there is a significant fat pad cushion just under the skin. The fat pad is what cushions your skin when you step on it with the metatarsal bones. But fat is not only cushioning it’s also insulation. Fat is the reason whales can swim in Arctic seas. So if you apply an ice pack to the ball of your foot it will make the skin feel better but it won’t actually do much to reduce the inflammation in the plantar plate. A better routine then icing is the contrast bath soak routine. With this routine you’re alternating hot water and cold water submersions of the foot to shut off the inflammatory response. This routine is very effective. We will put a link in the show notes so that you can access the video showing you exactly how to perform the contrast bath routine. Nonsteroidal anti-inflammatory drugs are some of the most commonly consumed medications on the planet. Ibuprofen is probably the most well-known of these. But there are others including naproxen. Although these medications are available over-the-counter, and you don’t need a prescription to buy them, they are still powerful medications. If you take them at high doses they will reduce the inflammation. The problem is that nonsteroidal anti-inflammatory drugs have been shown in studies to reduce the healing of tendon to bone junctions. Since the plantar plate is basically a ligament that connects two bones via a ligament made of collagen, you might slow down the healing if you take these medications. Corticosteroids are basically more powerful versions of nonsteroidal anti-inflammatory drugs. But they have lots more side effects. Some people who take them may become anxious, have fluctuations in their blood sugar, suffer anxiety or difficulty sleeping. But as a foot and ankle surgeon who treats runners my primary concern with taking these medications when you have a plantar plate sprain is that the corticosteroids weekend college and bonds. Since the basic problem with the plantar plate sprain is that some of the collagen bundles and fibers have been damage or torn, it seems silly to take a medication that could actually make those collagen bonds weaker. Some doctors will inject the joint capsule with corticosteroids in order to shut off inflammatory response. This treatment is extremely effective in reducing the pain. But it is extremely risky. If you put powerful corticosteroids right into the joint where the joint capsule and plantar plate have been partially torn, it is entirely possible that the corticosteroids will reduce the inflammation leading to a more significant tear in the joint capsule and the plantar plate. If this happens, you might have to have surgery to repair the plantar plate. The only circumstance where I would consider injecting an athlete, particularly a runner, with a plantar plate sprain is if you had a lifetime goal you’ve been trying to achieve and suffer this injury…but still hope to get through the race. For example, if you’ve been trying to qualify for Ironman Hawaii for 10 years and then you get a plantar plate sprain a couple weeks before the race, I would inject it and let you do the race. Of course I would explain that this could cause a significant risk of the much worse injury later. But, if your goal is really to just do Ironman Hawaii, this risk maybe well worth it since you have been trying for a decade to get into the Ironman World Championships. The take-home message in this is that contrast baths are likely the best, lowest risk method of reducing the inflammation when you have a plantar plate sprain. To get the plantar plate injury to heal you basically have to keep it still enough that collagen can form and bridge the gaps where it is been injured. There are a gazillion different recommendations and treatment options that will decrease the stress to the plantar plate. You can use stiff shoes that have a steep rocker to the forefoot. You can wear a fracture walking boot. You could cast the foot with a fiberglass cast. You could use crutches or a wheelchair. You could wear custom orthotics to take pressure off of the area and stabilize your foot. Or you could even do something as simple as taping the toe to stabilize the plantar plate. As I’ve often mentioned, I believe doctors treating runners should keep one primary idea in mind. Unless there’s a specific race for which the injury must be healed, it is better to keep the athlete active, training, fit and even running whenever possible. So with that end in mind I think doctors should consider the least invasive, least disruptive and least restricting method of treatment. For that reason I most often have patients begin with a relatively simple treatment regimen and see if it will help improve. The simplest treatment is to tape the plantar plate. The plantar plate is a small ligament that reinforces the bottom of the joint capsule at the ball of the foot. When you sprain this ligament, the ball of the foot can be sore and ache when you walk. One of the best ways to decrease the stress to an injured plantar plate ligament is to tape the foot so that the ligament it stabilized and can heal. This video will show you how to tape the ball of the foot when the plantar plate is sprained or injured. The first thing you need to do is get the correct type of tape. The very best tape is called Tensoplast (or Elastoplast). It is good because it stretches when you walk. With Tensoplast tape, the toe can flex slightly without getting irritated. You should order one roll of tape that is one inch wide by five yards in length. Now that you have the right tape, you will cut a piece of tape to the correct length using your hand as a reference. The correct amount will reach from the tip of your finger the base of your palm. Next you will cut that piece of tape into two equal size pieces. Just cut the piece of tape lengthwise splitting it right down the middle. Take one of the two pieces and place it back on the roll to save it for later use. Now you are ready to tape the toe to help the plantar plate heal. Take the piece of tape and center it on the top of the second toe. You should place the tape between the foot and the last knuckle in the toe. The tape should be right at the base of the toe. Wrap one strand around the toe, pull down slightly to create some tension in the tape and stick the tape across the ball of the foot so that it is in place on the bottom of the foot under the little toe joint. Now take the other strand and it wrap it around the toe in the opposite direction, pulling down slightly to create some tension in the tape. This strand will cross over the other as you stick the tape across the ball of the foot so that it is in place on the bottom of the foot under the big toe joint. If placed correctly and looking at the bottom of the foot, the tape will look somewhat like a breast cancer awareness ribbon. With the tape in this position, the pressure on the tape when you walk will keep it secure. There should be just enough tension in the tape that the second toe is pulled downward slightly lower than the third toe. This will decrease the tension on the plantar plate at the bottom of the second toe joint and help it heal. You should keep the tape on 24 hours a day to protect the plantar plate as the sprain heals. Change the tape if the adhesive wears out and isn’t sticking to the bottom of the foot. If your skin becomes irritated, discontinue use. Don’t tape the toe if you have an allergy to tape or adhesives. Hopefully this will help you heal fast, and get back to running! The length of time it will take to heal a plantar plate sprain can vary widely. If you really have a minor sprain, you ice it immediately and tape it consistently, it could heal in just a couple of weeks. But just so you can understand the worst-case scenario I will tell you about a patient I actually treated who I thought would never heal. She was a totally healthy young woman. She got a relatively minor plantar plate sprain that was hurting when she ran for several weeks before she sought treatment. Not surprisingly, it got worse during this time. We tried taping the toe and doing contrast baths to reduce the inflammation but she wasn’t getting better. So then we progressed to a fracture walking boot. She fluctuated up and down in terms of her symptoms in the fracture walking boot. This one on for several weeks. Then she actually disclosed to me that she had to go on business trips to the east coast every couple weeks. She had to present cases to the FDA. And because she was presenting cases to the FDA she didn’t want any appearance of weakness. So she would take off the fracture walking boot when she was doing her presentations. After she continue to worsen I recommended that she use the fracture walking boot 24 hours a day and also use crutches and not walk on the foot at all. She started to improve. But then she went to do a presentation and she took off the fracture walking boot and left the crutches in her hotel room. At that point I saw her and I told her that she should just forget about it. I recommended that she just continued to walk on it and let it get worse until such time as it was convenient for her to have surgery. Because at that point I didn’t believe she could actually maintain the routine with the crutches and the boot consistently enough to actually heal. Eventually, her job changed that she didn’t have to go do these presentations anymore. She then used the fracture walking boot and crutches for about a month. The ligament completely healed. Truthfully, I was shocked. I thought you would have to have surgery. But the bottom line is it took about 18 months for her to actually fully heal. So the moral of the story here is you don’t want to monkey around with this. You want to try some simple things and see if it will improve but if it’s not improving quickly you want to do something more aggressive, consistently, right away! Now you understand a little bit about the plantar plate injuries and significance of them you should ask your doctor three questions whatever you go to seek treatment for pain in the ball the foot. How do you know for sure that I don’t have one of these other conditions that can cause pain in the ball of the foot? How can I maintain my running fitness while this injury heals? Are there any creative strategies or advanced treatments that may speed the healing? Runners are more active and have to hold their doctors to a higher standard. And after all, if you have a plantar plate injury, your ultimate goal is to keep running so you have to make sure that treatment the doctor offers you is the best path to achieving that goal! Surgery is risky. Pain, bleeding, infection, nerve entrapment and painful scarring are just a few of the commonly mentioned risks of plantar plate surgery. In fact, almost every surgical consent form I have ever read actually even mentioned “possibility of death” as a risk. But there are some subtle risks to runners that are not as frequently mentioned. Scar formation is a very real risk. If we cut the skin, you will get a scar. That’s just the way it works. Some doctors prefer to make a large S-shaped incision when they surgically repair the plantar plate. This incision gives the most exposure but it can cause the biggest scar. Dr. Mary Crawford is the former President of the American College of Foot and Ankle Surgeon and one the most respected foot surgeons on the planet. When I was lecturing on this topic about runners one time she actually said that she virtually never gets a problem with a straight linear scar directly under the plantar plate. Although it is counter intuitive, for some reason surgical repairs in this area don’t seem to cause a problem. The only exception to that she says is that she’s had some patients you have developed complications, but only if they are smokers. In spite of this fact, it still makes me quite a bit nervous when I do surgery on the bottom of any runner’s foot. I have heard patients ask, “Are there any guarantees with plantar plate surgery?” The answer is…Yes! You will get a scar. You will get a bill. But that’s it! There is no guarantee you will be running pain-free after plantar plate surgery. If you are a runner, it is actually more important to you than the average person that you choose the best treatment. Surgically repairing the plantar plate is not always the best choice if you want to keep running. But once you have made the choice to have plantar plate surgery, you cannot go back. Once you have surgery, the anatomy has been altered and the rules have changed. Once you understand the full implications of plantar plate surgery and you have considered all of the other treatment options, surgery may in fact be the right choice for you. But only if you have tried everything short of surgery to fix the problem. 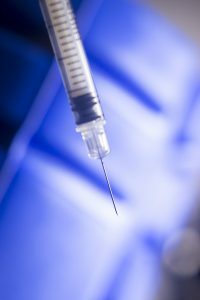 It is critical that you discuss all of the non-surgical options with your surgeon, before you have plantar plate surgery, or any other risky, invasive and potentially harmful treatment…such as a corticosteroid injection. Above all else make sure that your doctor understands that you are a runner and you want to keep running! Explain the types of races you run, how many miles per week you run, and the amount of training required for those races so your doctor can take your desire for high level running into consideration and then determine which treatment is best for you. Sign up now to get the exact same treatment instructions I give to runners in person! we’ll give you a full 100% refund. If you have a question that you would like answered as a future addition of the Doc On The Run Podcast, send it to me PodcastQuestion@docontherun.com. And then make sure you join me for the next edition of the Doc On The Run Podcast! Dr. Christopher Segler is a podiatrist and ankle surgeon who has won an award for his research on diagnosing subtle fractures involving the ankle that are often intially thought to be only ankle sprains. He believes that it is important to see the very best ankle sprain doctor in San Francisco that you can find. Fortunately, San Francisco has many of the best ankle sprain specialists in the United States practicing right here in the Bay Area. He offers house calls for those with ankle injuries who have a tough time getting to a podiatry office. You can reach him directly at (415) 308-0833. But if you are still confused and think you need the help of an expert, a “Virtual Doctor Visit” is the solution. He has been “meeting” with runners all over the world and providing just that sort of clarity through online consultations for years. He can discuss your injury, get the answers you need and explain what you REALLY need to do to keep running and heal as fast as possible. You can arrange a Virtual Doctor Visit with a true expert on running injuries. Right from the comfort of your own home you can meet online with the doctor, discuss your running history, talk about your running injury and figure out a customized recovery plan that will help you heal the running injury so you can get back to running as quickly as possible. Book your Virtual Doctor Visit with Doc On The Run now!